(P1) The government of Uganda used SOPHISTICATED SURVEILLANCE technology to target opposition members, journalists, and activists, according to an INVESTIGATION from the London-based WATCHDOG Privacy International. 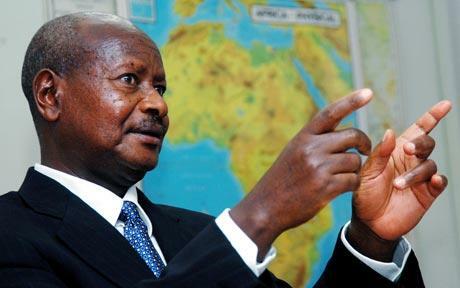 The report, based on secret government documents, shows how Ugandan President Yoweri Museveni personally SPEARHEADED a CAMPAIGN to spy on and VANQUISH OPPOSITION MOVEMENTS following the 2011 presidential election. (P2) The government’s weapon OF CHOICE was a highly INVASIVE form of spyware called FinFisher, produced by Gamma Group International, a UK-based company with AFFILIATES in various other countries. FinFisher is capable of remotely monitoring computers, smartphones, and other equipment in real time, and has been sold ON THE OPEN MARKET to REPRESSIVE governments. (P3) The Ugandan government purchased FinFisher in 2012, documents show, after Museveni launched Operation Fungua Macho (“open your eyes”). The INITIATIVE involved 70 INTELLIGENCE officials, and was launched in response to WIDESPREAD political UNREST that ERUPTED over ALLEGED corruption, police BRUTALITY, and high living costs following the 2011 election. More than 600 people were arrested or DETAINED, including members of PARLIAMENT. (P4) FinFisher was the “BACKBONE” of the operation, Privacy International reports, which aimed to BLACKMAIL opposition members and “crush… CIVIL DISOBEDIENCE.” FinFisher “access points” were installed in Uganda’s parliament and other government institutions, and Museveni’s opponents were targeted in their homes, as well. Gamma trained four Ugandan officials on how to use FinFisher in late 2011, after a second wave of protests erupted. (P6) There’s cause for concern GOING FORWARD, as well. According to Privacy International, Uganda is close to acquiring a centralized communications monitoring center ahead of next year’s presidential election. (P8) Government spokesman Colonel Shaban Bantariza tells the BBC that there is “no evidence” that any opponents have been monitored. Would you agree with the idea that any way a technology can be abused, it will be abused? Governments often make DENIALS of various activities. Do people believe those denials? Do you think that Gamma Group International has any moral QUALMS about selling its technology to repressive governments? Do you believe that politics is becoming more dangerous in many countries?